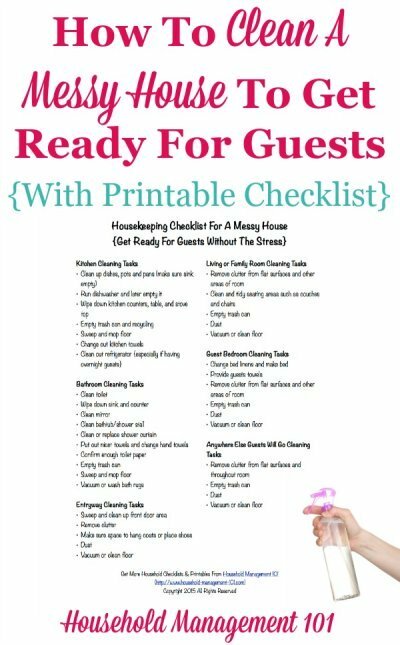 Here's a plan you can use whenever you're going to host guests to clean up your messy house, using this free printable housekeeping checklist. When you hear guests are coming to your house, perhaps for a holiday gathering or a party, do you panic? If your home is currently messy you may feel like there is no way to get it all cleaned up before the guests arrive, but that's not true. First, take a deep breath, and then come up with a plan of attack to get everything looking presentable. Coming up with a plan of attack to get your messy house ready for guests isn't complicated, but the key is to make a reasonable plan, and then stick to it to avoid distractions. Why did I emphasize the word "reasonable?" Because you can easily take on too much and then not be able to get it all accomplished. Come on -- we all know if guests are coming in two hours you shouldn't paint the living room no matter how badly it needs it! How much time do you really have to devote to cleaning between now and whenever the guests arrive? How messy is the house right now? While your guests are here what rooms will they be in? If you truly consider these issues when coming up with your plan you'll be able to decide exactly what you can accomplish, and prioritize the really important things and do them first. For example, if your guests are coming for an hour, and will only walk in the door and stay seated in your living room, don't even worry about tackling your bedroom before they come. Just close the door there and instead focus on the entryway and living room. In addition, still clean up the guest bathroom since you never know when someone will need to use the restroom! Also, keep in mind the whole point of cleaning before your guests arrive. It is to make them, and you, feel more comfortable. It isn't so everything can be absolutely perfect. If you strive to make everyone comfortable though it can seem more doable than setting an even higher standard for yourself that might not be attainable or realistic. Once you've prioritized what rooms need to be cleaned, and which ones don't, and how deeply you can clean based on the amount of time you've got, you've got to work the plan you've created. 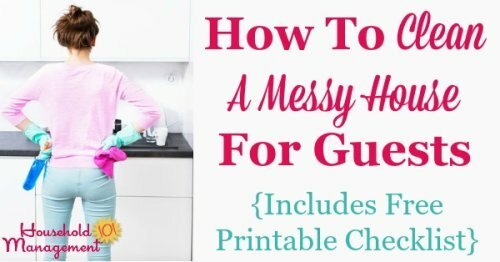 Seems simple enough, but when your house is messy already it is easy to get distracted by all the things you could do to clean it up. But that wastes time and energy that you don't necessarily have, plus it can lead to even bigger messes when you start a project you don't really have time for right now. So I find it best to have a written plan of attack. It helps me stay focused on the task at hand and to work down my list. If it wasn't an important enough task to write down it isn't necessary to do, at least not before the guests leave your home and you have time to tackle some of these projects you might notice need to be done. You can make your own list by thinking of the questions I've listed above, and in addition you can check out my suggested housekeeping checklist below to make sure you don't forget anything important. A quick explanation of the checklist tasks. I've written tasks for the kitchen and bathroom always, because no matter whether you invite them to go into your kitchen or not, guests seems to congretate there. In addition, you've got to at least have a guest bathroom ready for anyone visiting. Next I focused on the entryway since obviously all guests have to be able to come in the door. Then, you have to think about where else the guests will go, so I added the two most obvious areas, the living or family room, and the guest bedroom. 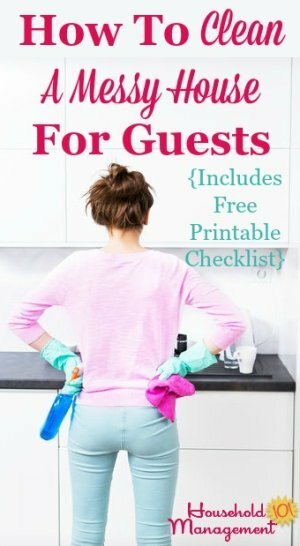 Obviously, tailor the list of rooms to clean based on where your guests will likely be during their visit. So below is the written version of the housekeeping checklist, and you can scroll down further to get the printable version. 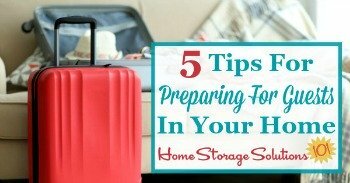 In addition, check out this article on the sister site, Home Storage Solutions 101, about what you need to do to prepare for guests in your home.